The Aqueduct of Segovia (or more precisely, the aqueduct bridge) is a Roman aqueduct and one of the most significant and best-preserved ancient monuments left on theIberian Peninsula. It is located in Spain and is the foremost symbol of Segovia, as evidenced by its presence on the city’s coat of arms. As the aqueduct lacks a legible inscription (one was apparently located in the structure’s attic, or top portion), the date of construction cannot be definitively determined. The general date of the Aqueduct’s construction was long a mystery although it was thought to have been during the 1st century AD, during the reigns of the Emperors Domitian,Nerva, and Trajan. At the end of the 20th century, Géza Alföldy deciphered the text on the dedication plaque by studying the anchors that held the now missing bronze letters in place. He determined that Emperor Domitian (AD 81-96) ordered its construction. The beginnings of Segovia are also not definitively known. The Vaccaei people are known to have populated the area before it was conquered by the Romans. Roman troops sent to control the area stayed behind to settle there. The area fell within the jurisdiction of the Roman provincial court (Latin conventus iuridici, Spanish convento jurídico) located in Clunia. The aqueduct once transported water from the Rio Frio river, situated in mountains 17 km (11 mi) from the city in the La Acebeda region. It runs 15 km (9.3 mi) before arriving in the city. The water was first gathered in a tank known as El Caserón (or Big House), and was then led through a channel to a second tower known as the Casa de Aguas (or Waterhouse). There it was naturally decanted and sand settled out before the water continued its route. Next the water traveled 728 m (796 yd) on a one-percent grade until it was high upon the Postigo, a rocky outcropping on which the old city center, the Segovia Alcázar, was built. Then, at Plaza de Díaz Sanz (Díaz Sanz Plaza), the structure makes an abrupt turn and heads toward Plaza Azoguejo (Azoguejo Plaza). It is there the monument begins to display its full splendor. At its tallest, the aqueduct reaches a height of 28.5 m (93 ft 6 in), including nearly 6 m (19 ft 8 in) offoundation. There are both single and double arches supported by pillars. 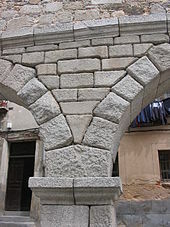 From the point the aqueduct enters the city until it reaches Plaza de Díaz Sanz, it includes 75 single arches and 44 double arches (or 88 arches when counted individually), followed by four single arches, totalling 167 arches in all. The construction of the aqueduct follows the principles laid out by Vitruviusas he describes in his De Architectura published in the mid-first century. The first section of the aqueduct contains 36 semi-circular arches, rebuilt in the 15th century to restore a portion destroyed by the Moors in 1072. The line of arches is organized in two levels, decorated simply, in which simple moulds hold the frame and provide support to the structure. On the upper level, the arches are 5.1 meters (16.1 ft) wide. Built in two levels, the top pillars are both shorter and narrower than those on the lower level. The top of the structure contains the channel through which water travels, through a U-shaped hollow measuring 0.55 tall by 0.46 meter diameter. The top of each pillar has a cross-section measuring 1.8 by 2.5 meters (5.9 by 8.2 feet), while the base cross-section measures 2.4 by 3 meters (7.9 by 9.8 feet). The aqueduct is built of unmortared, brick-like granite blocks. During the Roman era, each of the three tallest arches displayed a sign in bronze letters, indicating the name of its builder along with the date of construction. Today, two niches are still visible, one on each side of the aqueduct. One of them is known to have held the image of Hercules, who, according to legend, was founder of the city. The other niche now contains the images of the Virgen de la Fuencisla (the patroness of Segovia) and Saint Stephen. The first reconstruction of the aqueduct took place during the reign of the King Ferdinand and Queen Isabella, known as Los Reyes Católicos or the Catholic Monarchs. Don Pedro Mesa, the prior of the nearby Jerónimos del Parral monastery, led the project. A total of 36 arches were rebuilt, with great care taken not to change any of the original work or style. Later, in the 16th Century, the central niches and above-mentioned statues were placed on the structure. On 4 December, the day of Saint Barbara, who is the patron saint of artillery, the cadets of the local military academy drape the image of the Virgen de la Fuencisla in a flag. The aqueduct is the city’s most important architectural landmark. It had been kept functioning throughout the centuries and preserved in excellent condition. It provided water to Segovia until the mid 19th century. Because of differential decay of stone blocks, water leakage from the upper viaduct, and pollution that caused the granite ashlar masonry to deteriorate and crack, the site was listed in the 2006 World Monuments Watch by the World Monuments Fund. Contrary to popular belief, vibrations caused by traffic that used to pass under the arches did not affect the aqueduct due to its great mass. WMF Spain brought together the Ministry of Culture, the regional government of Castilla y León, and other local institutions to collaborate in implementing the project, and provided assistance through the global financial services company American Express.